Freelock developed an informational website for Answers for Elders. Answers for Elders is an online resource for adults caring for elderly parents. Branded as the "Boomers' Online Community to Help Mom & Dad," Answers for Elders assists men and women with the support they need to in turn support and care for their loved ones by providing professional articles and useful information. Revenue is generated from the sales of "Expert Decision Guide" advertisements. Freelock developed the Answers for Elders website, implementing key pages as specified by the company. We made a membership system so users could comment publicly on articles, a map-based decision guide for retrieving locational information, and example articles for composition purposes. Get in touch today if you have a site that could use some additional functionality! 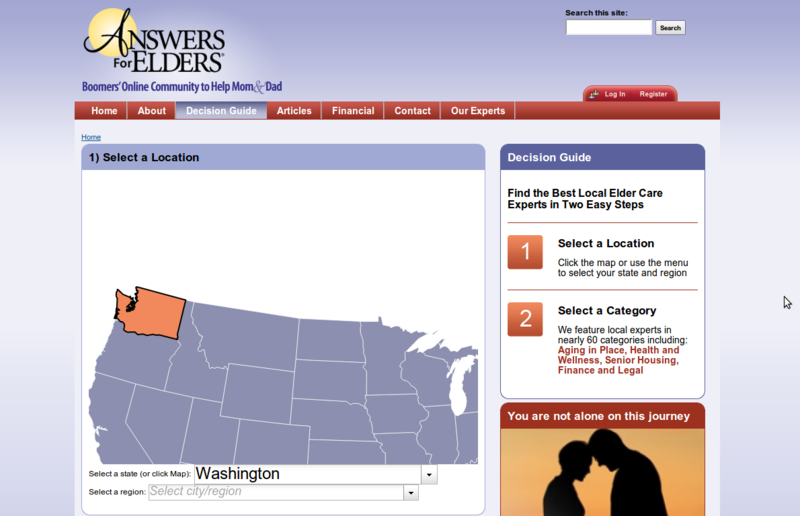 Recently, Answers for Elders was voted the People's Choice for "Best Caregiver Site" by SeniorHomes.com! Freelock is proud to have been instrumental in this journey. Congratulations, Answers for Elders!